First Glasgow has announced that it plans to invest in 75 new Euro VI and electric buses from ADL in 2019, after additional funding was granted from the Scottish Green Bus Fund. The buses ordered are 53 Enviro400 MMCs, 10 Enviro400 MMC Citys and 12 Enviro200 MMCs. A £400,000 investment from the Fund will supplement the £16.35m investment First Bus plans to make next year, following on from a £14m investment in 2018. 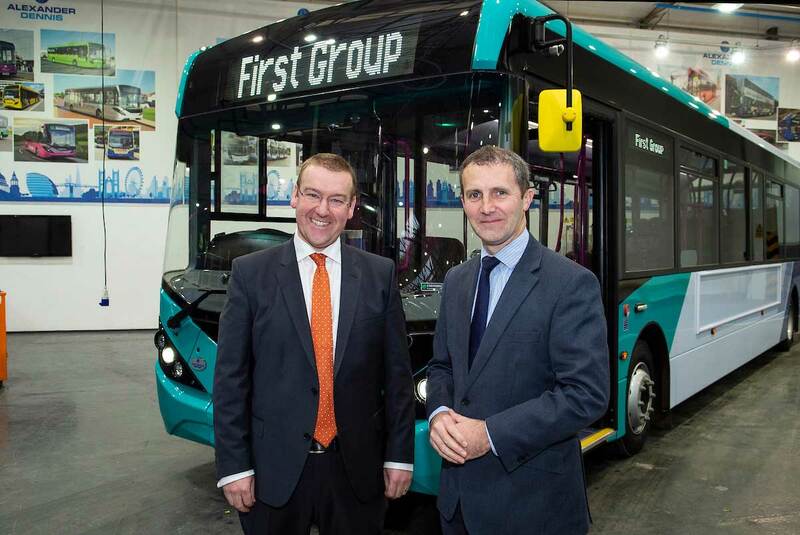 At an event hosted at ADL’s Falkirk factory, Andrew Jarvis, Managing Director for First Scotland met with Cabinet Secretary for Transport, Infrastructure and Connectivity, Michael Matheson to mark the latest award from the Scottish Green Bus Fund and to get an early look at some of the new buses on the production line. Andrew Jarvis, Managing Director for First Glasgow, said: “We are committed to working with Glasgow City Council, Transport Scotland and the Cabinet Minister to improve the city’s bus services. The bus is very much part of the solution when it comes to reducing emissions on our already congested roads as one full low emission bus can take up to 75 cars off the road. Keith Watson, Customer Development Director at ADL, stated: “We’re delighted to be partnering with First Glasgow to bring ultra-low emission Euro VI and electric vehicles to the streets of Scotland’s biggest city. “These Enviro double and single deck vehicles not only respond to stringent environmental demands but also to passengers’ increasing expectations thanks to premium onboard specifications and features.